More than 1,000 children were guests of Their Royal Highnesses Crown Prince Alexander and Crown Princess Katherine today at the White Palace, at the traditional Easter receptions for socially vulnerable children. Reception was attended by Father Vlada Vukasinovic who explained the importance of Easter to the children, as well as the numerous representatives of the diplomatic corps and socially responsible companies that have supported the organization of this very important reception for the children. 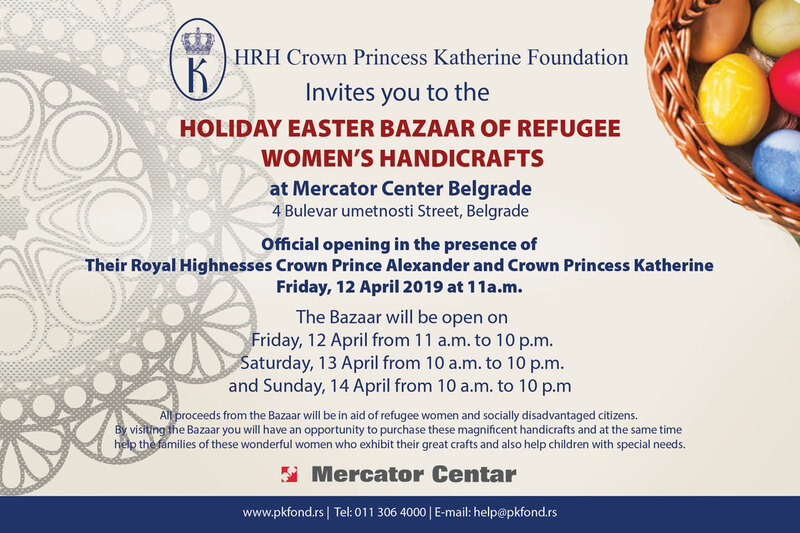 Children with disabilities, children without parental care and Roma children today receiving the gifts which the Royal Couple prepared for them with the help of many donors and their associates from the Crown Princess Katherine Foundation and Lifeline organization, whose patron is Her Royal Highness. Like every year, there was great joy for the young guests when the searched for colored eggs in the Royal Park in front of the White Palace, after which the Crown Prince and Crown Princess delivered toys, children’s books and sweets to the children. TRH Crown Prince Alexander and Crown Princess Katherine would like to thank all the donors who this year made it possible for the children to spend a beautiful and joyous Easter: humanitarian organizations Lifeline Chicago, Lifeline New York, Lifeline United Kingdom, embassies of Australia, Bosna and Herzegovina, India, Korea, Kuwait, Finland, Palestine, Pakistan, Delegation of the European Union to Serbia, companies Easygoing, Gamecredits, Orbico, Rauch Serbia, Chocoline, Marbo product, Evro Book, Balon centar, Coca Cola, ballet studio “M” Belgrade – Maja Rakita Marjanovic, schools International Primary School, kindergarten “Fantasy”, The International School of Belgrade, Deutche Schule Belgrade, volunteers and all others that helped Easter receptions.